Oslo sits at the head of the Oslofjord, an inlet of the Skagerrak. 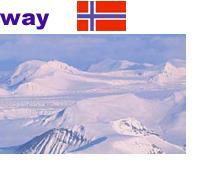 It is the oldest of the Scandinavian capitals, having been founded by Harald Hardrada in 1050. After being leveled by fire in 1624, the city was rebuilt in brick and stone by King Christian IV, who renamed it Christiania - a name that stuck until 1925 when it reverted back to Oslo. The city center is a pleasant jumble of old and new architecture with an abundance of museums, parks and monuments. Oslo was the site of the 1952 Olympic Winter Games. 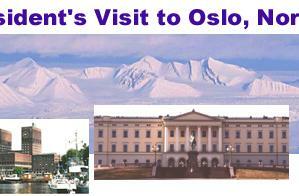 The Royal Palace is situated on a hill at the end of Karl Johans Gate, Oslo's main thoroughfare. The Swedish-Norwegian King Carl Johan ordered the Palace to be built in 1822. It was designed by Norwegian architect H.D.F. Linstow and constructed between 1825 and 1848. At present, Norway's King, Harald V, lives at the Skaugum estate in Asker, just outside Oslo, but spends his working day at the Palace. The President will then depart for the Prime Minister's Office. The Hall is a functioning government building. It was also the site where Prime Minister Rabin received the Nobel Peace Prize, together with Chairman Arafat and Israel's Foreign Minister Shimon Peres, in 1994. John Hume and David Trimble received the prize there last year. Following the luncheon, the President will depart for the Ambassador's Residence.